The emulsions for this paper are being produced on the original Agfa machinery, which ADOX purchased together with former Agfa engineers from the liquidator of AgfaPhoto in Leverkusen. 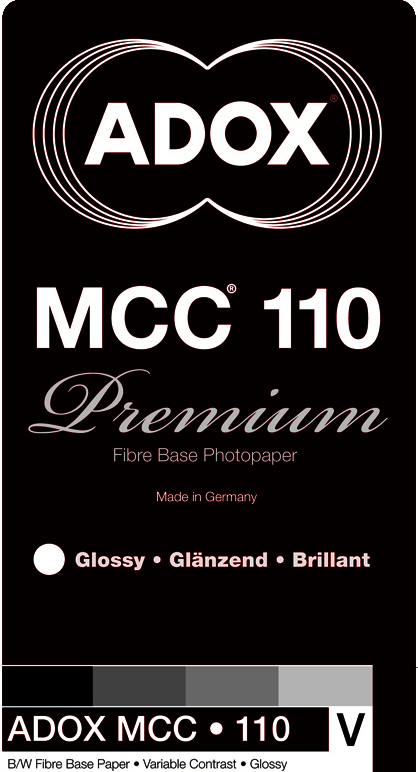 ADOX MCC is based on the legendary Multicontrast Classic technology. This paper is among the technologically most advanced papers in the world. With its four separately made emulsions which are coated together, it yields a constant step up in gradation over the entire range. The paper is made from selected raw ingredients which are all carefully tested for their photographic properties prior to emulsification. Before every coating run several test runs are made on on smaller machines in order to guarantee highest possible batch to batch consistency. This paper achieves a great tonal range and crisp blacks. In order to increase the paper´s brilliance, it is coated on a bright white base (unlike its predecessor which were coated on a tinted base). 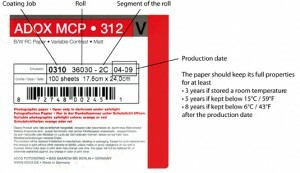 The production date is indicated on the label. The last 4 digits are the production date in the european format: MM/YY or MM-YY.